The private, for-profit education management organization Edison Schools is making steady progress in offering students and parents in Flint an alternative to the struggling traditional public school system. Edison Schools, founded in 1992 as The Edison Project, is the nation's leading private manager of public schools. The New York-based company manages public and charter-public schools through a partnership with school districts and charter school boards around the country. Edison runs four schools in Flint: Flint Northwestern Community High School-Edison Partnership; Garfield-Edison Elementary School; Williams-Edison Partnership School for Primary and Elementary Academies; and Williams-Edison Partnership School, Junior Academy. Edison offers a comprehensive management plan that features an ambitious and wide-ranging curriculum that emphasizes the use of technology, an emphasis that includes a computer on every teacher's desk and in the home of every student in grade three and above. Even though Edison schools are public schools—fully funded by tax dollars and open to any child—full responsibility for implementing the educational program, technology plans, and management systems rests with Edison. And Edison is accountable for results: If parents are dissatisfied with the company's performance, Edison's contract can be terminated. According to Rick Larios, Vice President of Educational Policy for Edison Schools, "Evidence shows that if we do not meet [parents'] expectations, they will take their child elsewhere." As elsewhere, Flint parents are looking for a greater number of educational options for their children. "I had sacrificed my sons to the [Flint Community Schools] gifted program because I thought that was the best option at that time," Marlene Smith, mother of three Flint school children, told The Journal Times of Racine, Wisconsin. "They didn't excel. They weren't successful, and I wasn't happy. I began looking for other options for my daughter." Smith and other parents with similar stories decided to try sending their children to an Edison-managed Northwestern Edison High School. And since 1997, these parents and their children have benefited from Edison's academic standards, smaller class sizes, longer school days, and extended school year. "Children in Edison classrooms are provided with an atmosphere that gives the student more of a sense of belonging," according to Eylastine Green-Roberts, principal of Northwestern. "Five core teachers work with the same students, who travel with each other daily. It gives them an opportunity to build relationships." The relationship-building process between teachers and students can last up to three years at a time, but for the process to work, the same people need to remain in place. If they do not, the Edison formula can get disrupted. For example, during 1997, Edison students in Flint scored significantly lower on the MEAP test when compared to the rest of the state. Larios attributes the poor performance to a high degree of teacher turnover that first year and to the large percentage of low-performing students whose parents sent them to Edison in hopes of improvement. Now that there is consistency in personnel in the Flint-Edison schools, children are performing better. "It takes time to grow," says Cheryl Tate, a teacher at Garfield Edison Elementary School. "The public looks for changes right away. That won't happen. We've been in a negative situation for so long. It's a process, and the public has got to be patient." Part of the Edison process is to give students a greater degree of personal attention and free access to technology. Every student, teacher, principal, and administrator has easy access to classroom computers and other technologies, including video cameras, cassette tape recorders, VCR's, televisions, and laser discs. Of course, information technology can make a student, teacher, or school more effective—but only when used as a tool and not as a substitute for teaching. In Edison-managed schools, technology is fully integrated with the education program and used to facilitate communication, research, writing, and analysis-just as it is used in the "real" world outside of the academy. The burgeoning for-profit education industry is driving exciting new innovations in the nation's public school system. Increased competition—whether from charter and private schools or management companies like Edison—is offering parents more options than ever before. Freedom of choice is encouraging all schools to compete for the right to educate children or suffer the market consequences of failure. Edison Schools, although young and still improving, is the first of the many new for-profit companies to offer a private-sector option to public school parents. 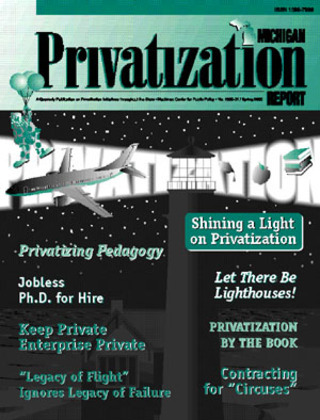 Its success is proof positive that privatization in public schools need not be limited to food service and bus driving. The private sector can offer success in the classroom as well. Brian Scoles is education project administrator with the Mackinac Center for Public Policy. "Jobless Ph.D. for Hire: Will Teach Students Who Cannot Afford College"
K-Zoo's "Legacy of Flight": Will Taxpayers Be Taken for Another Ride?